Oh Heck! No I'm not blaspheming, merely telling you about who I'm collaborating on with this post. 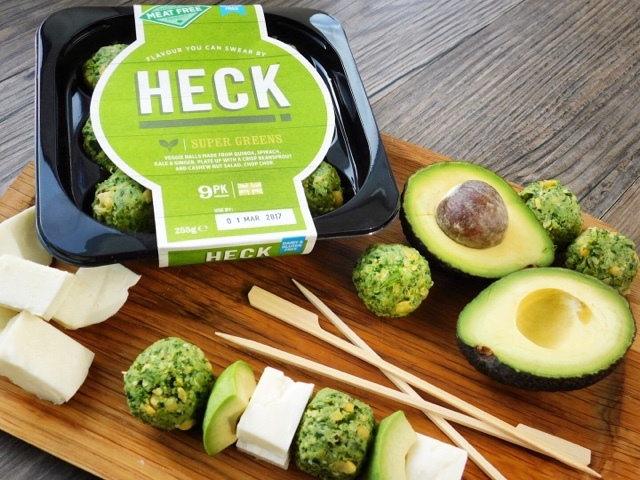 HECK are probably best known for their fab sausages with flavours you can swear by (and names that will make you smirk) however they've gone green and now have a new range of veggie burgers, bangers and balls all officially approved by the Vegetarian Society. Currently exclusive to Waitrose, as well as being meat free they are also dairy free, gluten free and low in fat. Retailing at £3 for a pack of 9 the Super Greens veggie balls are made with quinoa, spinach, kale and ginger whilst the 9 Thai Bites Veggie balls are made with fragrant thai pesto, sweet potato & sticky rice. Both pack a real punch in terms of flavour. Following the excitement of Christmas you could be mistaken for thinking that all goes quiet with regards to foodie celebrations however there's pretty much always a day/month/occasion to be celebrated. Amongst the somewhat tenuous Nutella Day, Toast Day, Strawberry Day and Yorkshire Pudding Day, January and February have already brought us Veganuary, Burns Night, Chinese New Year, Valentines Day and Pancake Day. March kicks off with St David's Day and Fairtrade Fortnight with 17th March bringing us to St Patrick's Day. National day of all things green (and black). So when Heck asked me to get creative with their Super Greens there was only one way to go - add more green! 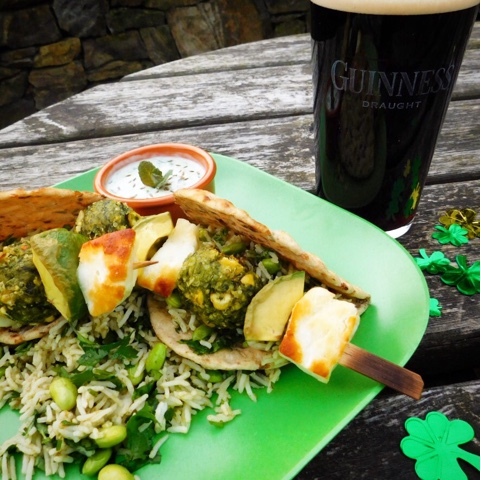 Pinterest is full of green food to celebrate the luck of the Irish however much of it owes its vibrancy to copious amounts of artificial food colourings. None of those in this recipe - nature really does have the best colour pallet. Heck suggest serving up the Super Greens with a crisp beansprout and cashew nut salad #chopchop and stir frying the Thai Bites with bok choi and a sprinkle of chilli #chopsticksoptional I'm also going to give Kate at Veggie Desserts recipe a try for Vegan Noodle Salad with Peanut Sauce and Thai Bites. To add further greenness to my super greens I used avocado, soya beans, thai green curry paste, coriander, cucumber and mint. Oh and a green plate. If you have never grilled (or BBQ'd) avocado before, you are in for an absolute treat. The texture of charred on the outside and smooth and creamy inside is simply divine. As for grilled Halloumi - hot squeaky cheese is my idea of absolute heaven. Without further ado grab your green balls and a pint of the black stuff and give 'em Heck this St Patrick's Day. If using wooden skewers, soak in water for 30 minutes. De-stone and cut your Avocado into quarters. Peel and cut each quarter into three. Cut the Halloumi cheese into bite sized cubes. 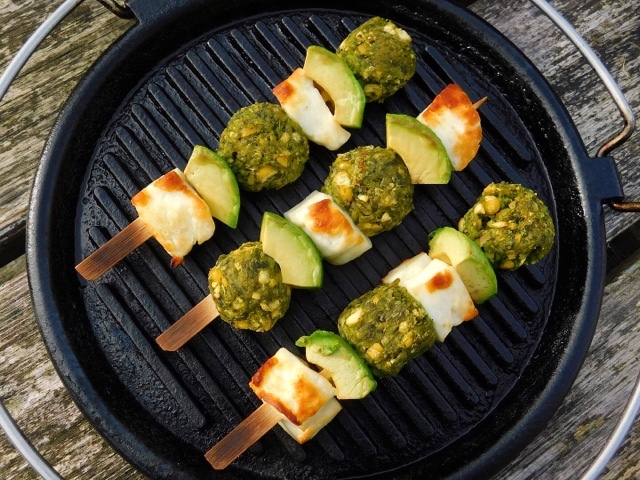 Carefully thread the Super Greens, Avocado and Halloumi onto skewers. To make the Raita grate the cucumber on the largest holes of a grater and place in a bowl along with the yoghurt. Season well with salt and pepper and stir through the cumin seeds and chopped mint. The skewers can be cooked under the grill, on a griddle pan or if weather permits, on the BBQ. Cook them on a medium heat for 7-10 minutes turning occasionally until golden brown and warmed through. Meanwhile stir fry the rice along with the Thai green curry paste and soya beans. When heated through mix in the chopped coriander. 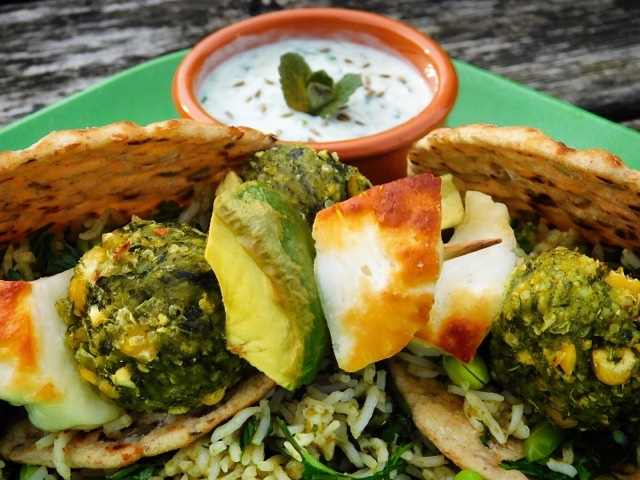 Warm the flatbreads in the oven or toaster and serve filled with the Thai Green Rice, Super Greens, Halloumi and Avocado Skewers and Cucumber & Mint Raita on the side. Disclosure: This is a commissioned recipe for Heck. As always, all views expressed are my own. I love anything with halloumi cheese so these are right up my street. They look delicious! 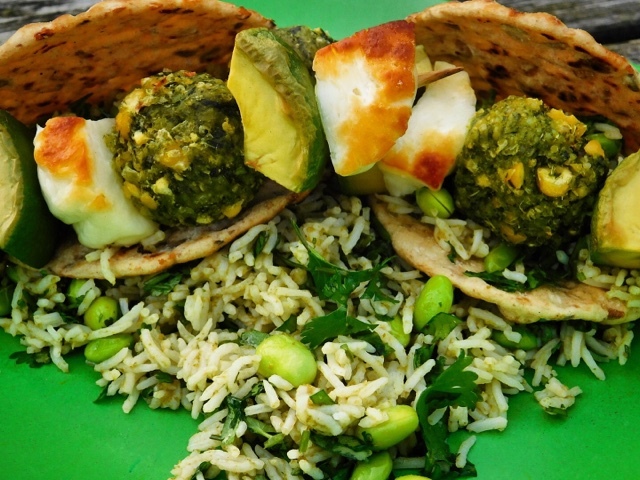 There is something very addictive about Halloumi, I can't get enough of its squeaky goodness! I've tried the Oh Heck sausages and they are good, so I'm thrilled to see some veggie offerings from them. Love the flavours you've added - it all makes for a very green plate. Yup I'm a fan of their fab sausages too - especially the chicken ones. Their veggie offerings are equally good. I love the Heck range and this is my kind of recipe. Push the plate this way! Stumbled, yummed and pinned. I'm afraid the plate is now well and truly empty Jac, but I have some more in my freezer! Fantastic colour. So lovely to see some veggie items in their range. Looks delicious. No need for artificial colouring when you've got nature's paintbox at your disposal. I impressed myself with the combination of textures and flavours in this one. Green is most definitely good. 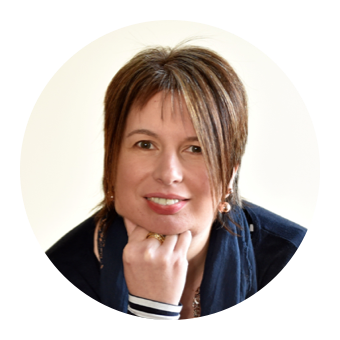 Apologies if I shocked you with my colourful language ;-) Do keep an eye out for Heck, they have a fab range of products both meaty and veggie. Such beautiful green skewers! I love the addition of those Heck veggie balls and the haloumi cheese. Yum! The addition of Haloumi Cheese makes anything better! Why is it so much more exciting to eat something off a stick I wonder?? Yum! 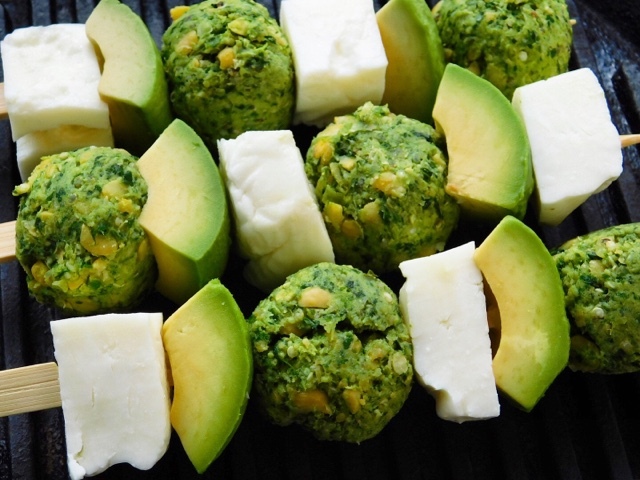 I love halloumi and of course I love avocado so this sounds delicious to me! Doesn't everyone love avocado these days or are there some haters out there?! Wow! These Super Greens look super healthy and yummy! I love that you used halloumi as well! One of my favs! Super Green. Super Healthy. Super Yummy. That could indeed be their tag line!